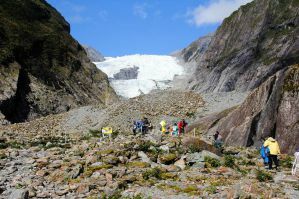 The small town at the base of Franz Josef Glacier is a jumping-off spot not just for the glacier, but also for Aoraki Mount Cook National Park. 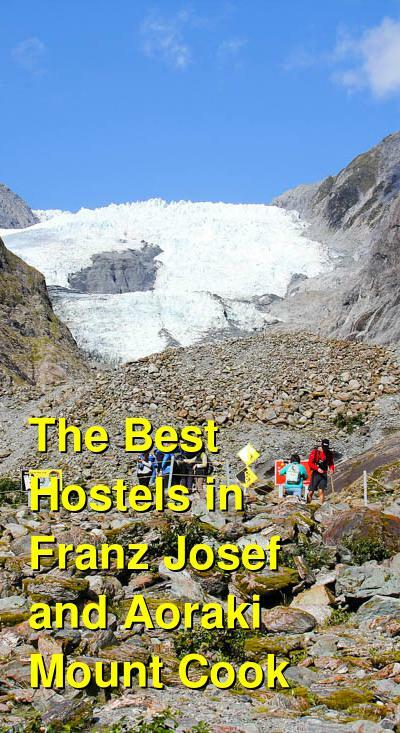 Hostels in this small town have a lot to offer! Many have lodge-like atmospheres due to the cold nature of the glacier. Most offer free breakfast and free Wi-Fi, plus a lot of great common areas, log fires, hot tubs, and more! The Rainforest Retreat is more like a resort with dorms for budget travelers than just a hostel. Yes, they have shared dorms as well as private rooms at budget prices, but they also have 6 acres of land to spread out on, plus an onsite bar and restaurant, hot tub & spa, and more. The bar and restaurant are the social center, but they are not close enough to the rooms to prevent you from sleeping. The food at the restaurant is top notch, as they take their culinary creations quite seriously. Howe many other hostels can say that? The bar has nightly DJs, too. The hot tub is huge, making for another great spot to enjoy getting to know your fellow guests. The communal kitchen is large and offers multiple cooking stations to accommodate individuals or even larger crowds who might want to cook their own meals. But don't forget about the Free Breakfast! Rooms are clean and modern, and have balconies, ensuite bathrooms, and great heaters. This establishment also offers camping spots for those with camper vans or their own equipment. Laundry facilities, bike rental, tour booking, Wi-Fi, pool table & foosball, BBQ, TVs, a sauna, and more are also on their list of amenities. Many guests claim this is the best place in town for a variety of reasons (check out the reviews), but some guests take off a bit for inconsistent cleanliness. This friendly hostel has a lodge-like feel and offers a long list of great amenities. Located right in the middle of the small town of Franz Josef, they offer dorms and private rooms, with and without ensuite bathrooms. All facilities are modern and clean, and dorm bunks have curtains and ensuite bathrooms so that you're not sharing with a lot of other guests. Free breakfast will start your day off right, and in the evening enjoy their bonfire, free soup, and hot tub. All of these fun features will help you mix and mingle with the other guests, as will the spacious common room areas with comfortable sofas, the large and fully-stocked shared kitchen, BBQ, and outdoor terrace. They also offer standard amenities like laundry, TV with movies (with popcorn! ), and free Wi-Fi. Guests give this hostel plenty of praise for the friendly staff, fun social vibe, and lots of freebies. Just a short walk outside of the main part of the town, the YHA Franz Josef provides a great list of amenities in a very modern and updated establishment. Seriously, check out the photos to see how immaculate this hostel / hotel really is! With dorms, plus private rooms of various sizes for couples all the way up to larger families, accommodation options can be found for everyone. Some rooms even have balconies with great views. The communal kitchen is large, modern, and offers plenty of room for all. The common areas with games, a TV, and pool table are also a nice place to relax and meet other guests. Room decoration is basic yet modern, and newer mattresses make the beds comfortable. Guest reviews tend to focus on the great amenities, modern facilities, and quiet atmosphere. Situated in the middle of town and very close to the glacier, the Montrose has a long list of free amenities for guests. The clean, modern, updated facilities at this hostel will make your stay very nice and comfortable. With private rooms and dorms, with and without ensuite bathrooms, they have a room at everyone's price point. All-female dorms are also available. On the list of amenities is free breakfast, free Wi-Fi, free evening soup, free movies and popcorn, and free tea, coffee, and hot chocolate. They also have a laundromat, spacious common rooms, a BBQ, outdoor patio, shared kitchen, and more. They get a lot of positive reviews from guests. Check out the photos! Another of the Sir Cedrics line of hostels, the Glow Worm is located just down the street from their other Franz Josef Cheatau property. And like their other establishment, they offer a lot of great amenities at an affordable price. Here, they specialize in nightly activities and have cottages instead of private rooms, but dorms are also available for the backpackers and budget-minded travelers. Some of their rooms have small kitchenettes, while most have TVs and ensuite bathrooms. A shared kitchen, common area with TV, and outdoor spaces let guests socialize and plan their daily activities. With very high marks all around, guest rave about the friendly staff, long list of amenities, nice and clean facilities, and more. It's definitely worth looking into this one!